This post is sponsored by Arla. 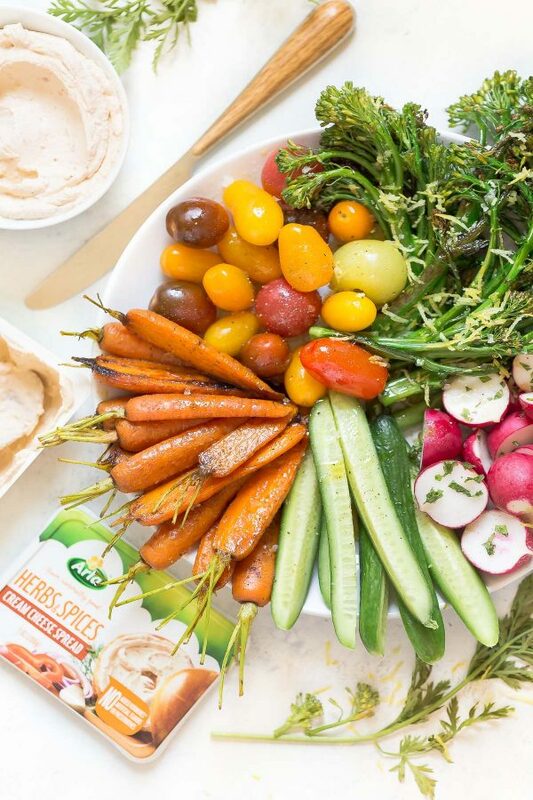 Here’s how to make a better vegetable platter with recipes for tandoori spice carrots, lemon broccolini, radishes, cucumbers, tomatoes – or swap in any seasonal veggies – with a quick and easy cream cheese to dip! 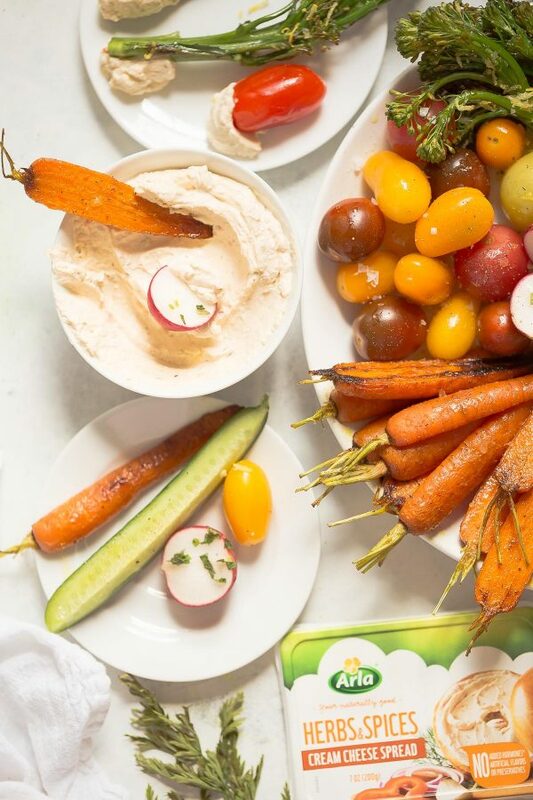 When I was younger and much, much rounder, I remember learning the word for the baby carrots, celery sticks, and raw broccoli that sat alongside the other—let’s be honest, better—appetizers at parties: crudité. In my mind, they were taking up precious space. Filler, like the kale leaves underneath a deli platter that make it pretty but aren’t edible. Not until I lost 135 pounds did I begin to look at the vegetable platter differently. Suddenly, I got it. At a party, where I’d ordinarily be elbows deep in chips, dip, and cheese, the carrot sticks were my allies. Now the ranch dressing? Not quite as friendly. 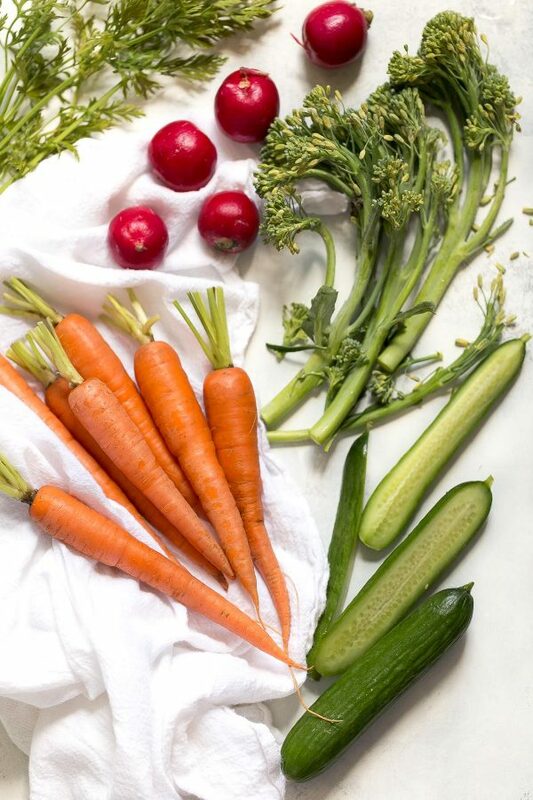 The vegetable platters of yesteryear might have been pre-packaged, pre-cut veggies with a tub of ranch dip, but now a veggie platter can be a fresh, colorful garden on your table—the prettiest, healthiest centerpiece. I choose veggies based on look, taste, texture, and season, and like to raw options with 1 or 2 cooked ones like the Tandoori Spice Carrots and Lemon Broccolini I made here! Tandoori spice carrots = baby carrots seasoned with a warm, smoky, mildly spicy blend of cumin, ginger, turmeric, garlic, coriander, and cayenne. The carrots are roasted until tender but still crisp, to bring out more of their natural sweetness. You can use the small carrots like I found or traditional baby carrots, sold in bags–just be sure to dry them really well with paper towels since they tend to be very wet and water-logged and won’t hold onto the oil/spice mixture quite as well when roasting. 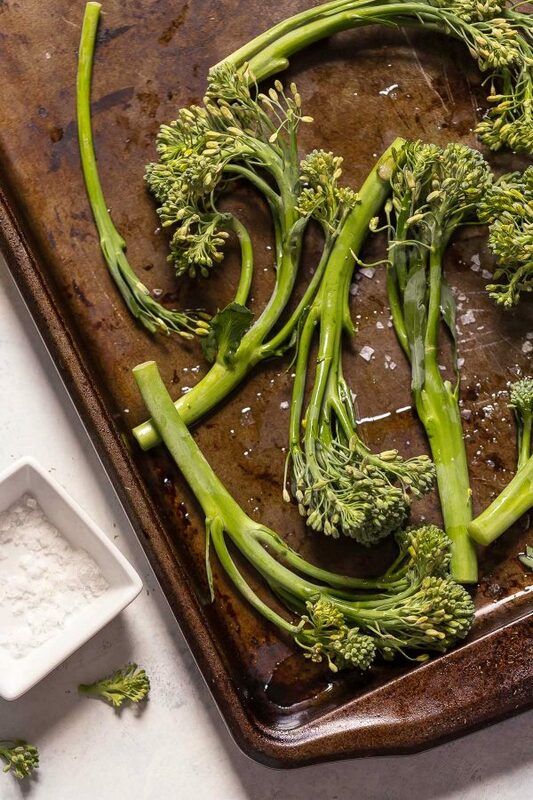 Lemon broccolini = the long spears of broccolini make great dippers, and here they get a quick coating of olive oil, a sprinkling of dried dill, and then a trip in the oven to roast until browned. Last, I squeeze lemon juice and grate lemon zest over the spears for an ultra-fresh, zippy finish. Keeping fresh vegetables on the veggie platter is still essential for texture and ease. My 3 fresh veggies: Persian cucumbers, which, if you’re not familiar, are just thinner-skinned, slightly sweeter cucumbers that measure about 4 to 5 inches in length. Feel free to use any kind of cuke! Also on the platter: radishes and grape tomatoes. 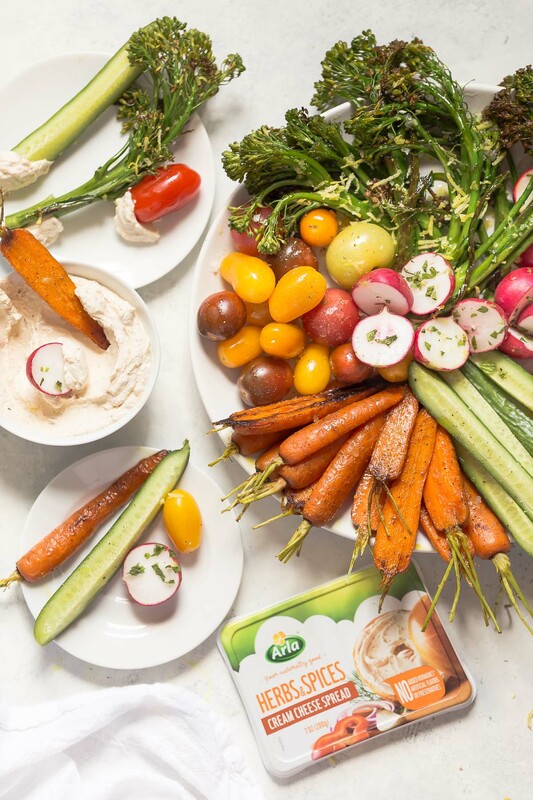 Every veggie platter needs a creamy dip, and one that has some punched up herb flavor. I use Arla Herbs & Spices cream cheese because it has kicks of dill, paprika, onion, and garlic (and I’ll admit I was swayed by that beautiful, beachy, sunset-orange color). The flavor can’t help but complement and enhance the vegetables. It’s silky and creamy enough to be dippable, and light enough to actually enjoy without regrets. Even as someone who thinks ranch dip/dressing is delish (ever dipped your pizza crust in ranch? ), this herbs & spices cream cheese is a real cut above the typical dip mix. There are no added hormones* or artificial flavors. This is how I think about it: if I’m already eating good-for-me veggies, why not try for something simply better in the dip department? *The FDA has determined that there is no significant difference between milk derived from rBST-treated and non-rBST-treated cows. Preheat the oven to 450 degrees F. In a small bowl, mix the cumin, ginger, turmeric, garlic powder, onion powder, cayenne, salt, and pepper. 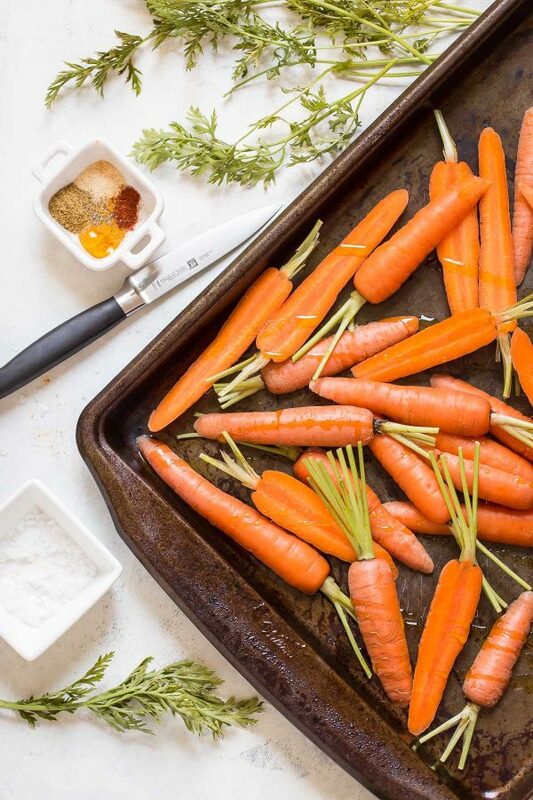 On a large, rimmed baking sheet, toss the carrots with the olive oil. Add the spice mixture and toss to coat the carrots. Arrange them on the pan in a single layer and bake until browned and tender but still slightly firm, about 20 minutes. On a separate baking sheet, toss the broccolini with the olive oil. Season with the dill, salt, and pepper. Arrange in a single layer and roast until browned and tender, about 15 minutes. Remove the broccolini to a plate immediately so that it stops cooking and squeeze fresh lemon over the top. Sprinkle the lemon zest over the top. Arrange the tandoori spice carrots, lemon dill broccolini, radishes, cucumber, and grape tomatoes on a serving platter. Spoon the cream cheese into a small bowl. Serve with small plates and plenty of napkins. 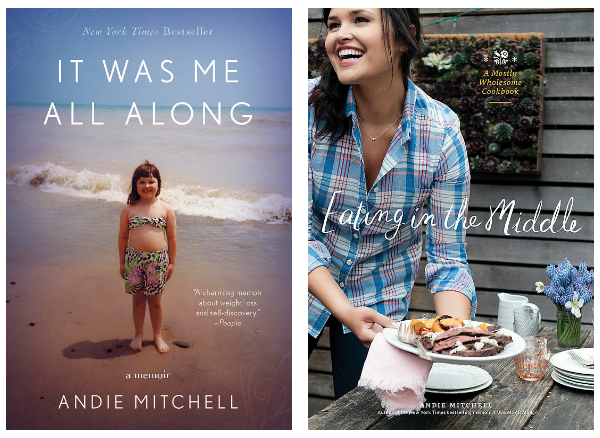 I love your recipes and the picture you provide with them, Andie! Great recipe indeed! The spinach I ate this morning looks really boring now. Thanks! I love the idea of including these Tandoori carrots alongside raw veggies. Can’t wait to try these out! It’s such a great idea to elevate crudites by seasoning and roasted them! The tandoori spice carrots sound especially delicious. Love your healthy recipes! I’m not a great cook and this definitely makes it easy to eat healthy! What a wonderful fall dish! I love all the colorful veggies! Lemon Brocollini sounds amazing! I am going to have to try this recipe this weekend! Thank you! This tray looks wonderful. The Tandoori carrots I need to try them out. My family really enjoyed the recipe.